All visual media offers potential value to advertisers. With successful new platforms, it’s often just a matter of time before a paid option becomes part of the package for brands. It should come as no surprise, then, that three of the hottest visual properties on the social web—Pinterest, Tumblr, and Flipboard—are entering the social media advertising fray. With their latest offerings, these three are now not only competing with other visual platforms for eyeballs, but also with the social media giants for advertising dollars. If you’re not yet up to speed on Pinterest’s latest acquisition or Flipboard’s new ad options, and want to find out what these changes might mean for your brand, we’ve got the answers. This big week for ad tech started with the announcement of Pinterest’s acquisition of Kosei, a data software company specializing in personalized recommendation modeling. It’s not difficult to see the advantages of data analysis for the photo-sharing network: each user’s collection of Pins, repins and Pinboards can offer insight into their product preferences and buying habits. Relationship modeling technology, such as the one Kosei specializes in, has a huge potential to make the process of targeting potential customers for brands much more efficient. No longer a mere hobby network, Pinterest has been ramping up its efforts to keep its new status as an e-commerce leader. The network’s first step was a testing of Promoted Pins, a paid advertising option which allows brands to place Pins featuring their products in users’ search results and categories. Promoted Pins were first rolled out to a test group of brands, and expanded to other US advertisers at the beginning of January. The company saw a promising 30% earned media rate from user sharing behavior for Promoted Pins; thus, Pinterest’s decision to boost targeted advertising with smart recommendation algorithms comes at the right time. According to Pinterest’s Head of Partnerships Joanne Bradford, this is just the beginning of the company’s aggressive move into ad tech. Coupled with Pinterest Analytics, the Kosei deal signals that if your brand has not yet discovered the benefits of using Pinterest for business, 2015 may be the right year to start pinning. Pinterest and Tumblr often come up together in conversations about photo-sharing networks. In late 2014, both networks were also named the fastest-growing in their sector, with active user growth for both exceeding 100% in just six months, according to numbers released by GlobalWebIndex. As a result, online media experts started noticing a trend when Tumblr matched Pinterest’s buy announcement with one of its own. Instead of bringing in more external talent, Tumblr has turned to the network’s power users as a source of creative input. The Creatrs Network initiative, unveiled on Wednesday, will pair popular creators with brands wishing to advertise on the platform, in order to create sponsored content that will appear in Tumblr users’ feeds. Creatrs Network will thus provide exposure to both the Tumblr-grown artists and their brand partners. Creatrs Network capitalizes on the power users’ existing knowledge of the type of content their followers find attractive. This move on the company’s part ensures that advertising will be tailored to the network’s format from the get-go, saving time on both beta testing different ad formats, as well as the collaboration process between creatives and brands. According to Wired, brands would simply have to join the Tumblr Creatrs Network, outline their idea for an advertising campaign, and get a selection of artists from a pool of Tumblr users. Tumblr’s rapid growth and advertising efforts in the coming year may be a good reason to consider using the blogging network to expand your brand’s audience. If you’re not sure where to start, read how you can use Tumblr for business. While Flipboard has been supporting native advertising for a few years already, the social magazine platform is now rolling out a new ad format, called Promoted Items, to increase the reach of sponsored content. The new format will allow brands to distribute promoted content in Flipboard users’ personal magazines, featuring a ‘Promoted’ label. The idea is similar to paid social posts on Twitter, Facebook and Instagram; similar to these networks, sponsored content on Flipboard will originate from the brands’ curated magazines or official website, and can feature calls to action such as signing up for a newsletter or following branded Flipboard magazines. Advertisers on Flipboard will be able to select a preferred interest channel for better targeting, with options such as News, Tech, Sports, Entertainment, Culinary & Food, etc. Content in Promoted Items can come in form of full articles, videos and photos. If your company’s content marketing strategy involves a mix of creation and curation, you may want to give the social magazine platform a try. 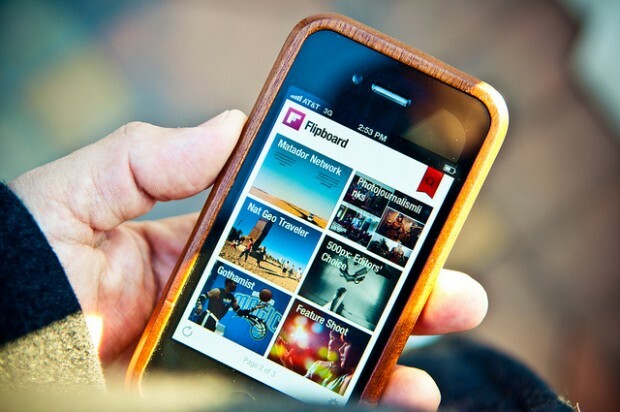 Flipboard organizes your content in an attractive, magazine-style format, and their mobile apps and Flip It web browser extensions make adding content to the magazine easy. If you decide Flipboard may be the curation platform for you, I’ve got good news—you can now use Flipboard directly from your Hootsuite dashboard. To see an example of what a Flipboard magazine looks like, take a look at Hootsuite’s magazine, Social Media Matters.